Penicillin was a wonder drug when it was first introduced in 1928 – and it has revolutionised medicine ever since. But what if you believe you're allergic to it? Up to 10 percent of people report being allergic to penicillin, but most may actually be able to safely use penicillin, either because they never were truly allergic or because they have lost sensitivity over time. 1. Penicillin allergy is serious and can be life-threatening. Anyone who is allergic to one type of penicillin should be considered allergic to all penicillins and avoid the entire medication group. This group includes more than 15 chemically related drugs, such as ampicillin, amoxicillin, amoxicillin-clavulanate and methicillin. If you are allergic to penicillin, talk with your doctor and pharmacist before taking any new medicine you are prescribed to confirm that it's not penicillin-based. Ask whether you should carry an epinephrine auto-injector, the only treatment proven to stop anaphylaxis, a life-threatening allergic reaction. 2. Penicillin allergy may not be a lifelong condition – a reaction in childhood does not automatically predict a reaction as an adult. 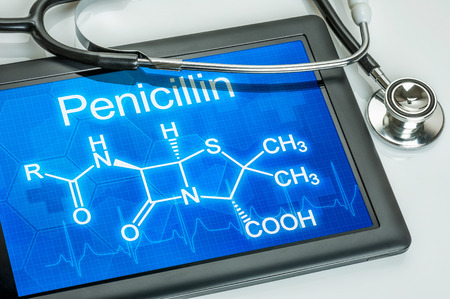 Only about 20 percent of people will be allergic to penicillin 10 years after their initial allergic reaction if they are not exposed to it again during this time. 3. Penicillin allergy symptoms may include hives, swelling of the mouth or throat, difficulty breathing or dizziness. Hives that suggest true allergy are raised, intensely itchy spots that may appear and change within hours – but not all skin rashes are hives. Non-allergy-related rashes may be flat, blotchy, and spread over days rather than hours. Since it may be difficult to tell the difference, and you can't always get to a doctor right away, take a photograph of the rash to help with the diagnosis. 4. Avoiding penicillin if there isn't an allergy diagnosis is not the best idea. Alternative antibiotics to penicillin – often called "broad-spectrum" – may be less effective in treating your infection, may cause unwanted side effects or may be more expensive. Don't limit your treatment choices – find out for sure whether you are allergic. 5. Testing for penicillin allergy is safe and reliable. The process is simple. First, the patient undergoes a series of skin prick tests, using gradually increasing amounts of penicillin. A raised wheal at the site of the prick indicates allergy. If the tests are negative, the next step is an oral challenge – drinking liquid penicillin. These tests should always be conducted by an allergist trained to recognize and treat potential allergic reactions. Anyone who believes they are allergic to penicillin because they had a reaction years ago should undergo testing with an allergist. If you are found to be allergic, then you'll have a confirmed diagnosis and will know what to avoid. If you're not, then you'll know that if you need penicillin, you can take it without concern.